Western Hognose snakes are a wonderful, small species of snake with lots of character. They have become more and more popular over the years and are now a commonly available species in the pet trade. In the wild they are known to feed on toads, lizard, snakes, eggs and even insects. In captivity however, they will regularly take to rodents. There are 3 subspecies of Western Hognose; the Plains Hognose Snake (Heterodon nasicus nasicus), the Dusty Hognose Snake (Heterodon nasicus gloydi) and Mexican Hognose Snake (Heterodon nasicus kennerlyi). The Plains Hognose snake is the most commonly seen in captivity, the care for all three species is virtually identical. Males grow to around 18” (45cm), females up to 30” (75cm). This is an excellent species of snake to keep in captivity, its small size, good nature and feeding response makes it a good beginners snake. 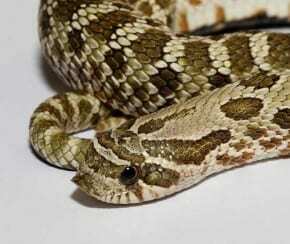 For an adult Hognose Snake, a terrarium 60cm Length x 45cm Width x 45cm Height is ample. Unlike highly timid snakes such as Royal Pythons, Hognose snakes will often fare well in larger enclosures. I would not recommend giving an over-sized terrarium as a hatchling, but as your snake reaches adulthood you could comfortably offer a larger enclosure for your snake providing there is plenty of hiding areas. If you decide to go for an extra large enclosure, you must provide plenty of cover and hiding areas. A hiding place can be anything from a large tupperware box with a hole cut out to a naturalistic piece of cork bark. There are many brands of fake plants and décor you can use which is both safe for the animal and pleasing to the eye. Cork bark is available from almost any reptile pet shop in the UK, and can be ordered in if they do not have it in stock. This is excellent cover for any reptile and is 100% natural. One thing you must consider when thinking about the size of the vivarium, is the bigger you go, the more hiding areas you must provide. I recommend at least one hiding place per 30cm in length of the enclosure for an adult Hognose snake. Like all reptiles, Kingsnakes require a thermal gradient, meaning they must be allowed to move around the enclosure to find their required temperature. The hot end of the enclosure should be 84-88ºF while the cool end should be approximately 74-76ºF. During the night, the temperature should drop to a more constant overall temperature of 72-74ºF. In my opinion, the ideal way of heating a Hognose snake enclosure is to use a Ceramic Heater. The WhitePython™ Ultra Slim Ceramic Heaters are the ideal choice as it gives off ample heat but equally doesn’t take up too much space in your terrarium. Ceramic heaters do not give off light and therefore in a terrarium you will need a form of lighting as well. To regulate the temperature accurately you should use a suitable thermostat. Power Plates, spot bulbs and heat mats are also ways of heating a terrarium. These all have their advantages and disadvantages, but in my opinion, none quite weigh out to be as good as ceramic heaters for large enclosures. Western Hognose snakes are diurnal, meaning they venture out in the day time. This is when their prey is awake. They will often bask in the sun, so lighting should be offered. Having artificial light in a terrarium is aesthetically pleasing to the owner, and is a good addition to a snake’s enclosure. They will use this as a photo-period, and their regular time clock will generally adjust to the settings on which you have your light set to. They do not require any form of special lighting, such as a D3 Ultra-Violet light commonly used for other diurnal species. The WhitePython™ range of LED lights are a great way to light your enclosure whilst using minimal electricity. They are also very slim and therefore do not obstruct your view into the terrarium. What’s more, they are available in virtually any length you require. If you would like a go a step further and see your snake’s activity during the night, you could use the Moonlight Blue or Nighttime Red versions of the LED lights. Western Hognose Snakes are generally not exposed to a high humidity range in the wild, and in captivity you should not worry about controlling this. A fairly dry environment should be provided, although raising the humidity when the snake is coming up to a slough may aid in shedding its skin properly. Hatchlings should be offered pinky mice, and as they grow the mice should become larger. An adult Western Hognose snake should be fed on large size mice or small weaner rats. Hatchlings should be fed on a regular basis, every 4-5 days is ideal. Their metabolic rate is very high and as they are growing, they need a lot more food to keep them going. Adult Western Hognose snakes need feeding once every 2 weeks on 2 large mice, perhaps one for males. The only exception when they should be fed more is bringing them out of hibernation, getting them into condition for breeding and then, fattening up females for egg production. An egg-laying female should be fed more often than normal, once a week on 2 large mice.